We have a new 'Theme' challenge starting today at Time Out. 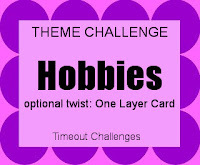 We also have an optional twist of making a 'one layer' card. If you do go with this twist you have the change of winning $20 to spend in our Sponsor, CAS-ual Fridays store. Our theme is 'Hobbies' and I went with the hobby we love all....crafting! I used our sponsor, CAS-ual Fridays products- ' Truth Is' stamp set and Truth-Bloom Fri dies. I firstly stamped the flowers and then heat embossed one in pink powder and die cut it, popping it up on foam pads. I then heat embossed the sentiment from The Ton Stamps. Our Guest Designer this week is the very creative Ashwini. I have been a fan of Ashwini for a long time now and her blog is full of inspiring projects-take a look here. Then come back and get crafty with us! Don't forget to pop on over to Time Out and see what amazing projects our team and Ashwini have made....what hobbies do you think they have??? Oh la la...I love the colored embossing on the dark gray. This is so stunning Sandie! I love that fabulous sentiment pink embossed on grey card stock - so perfect framed with those pretty flowers! This is a very unique color combo, I love the pink with the grey, looks amazing! 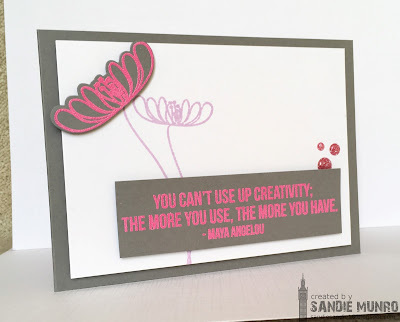 Those flower stamps are very pretty and the sentiment is just perfect for our challenge. Fun layout too, great work! This is such a wonderful creation Sandie. I love the shade of pink against that wonderful, rich grey. The lined flower adds the perfect balance. The quote is absolutely fantastic. I just love it. Great sentiment! I love the color palette you chose. Very pretty card! What a fantastic quote and so so true. Love how you used those pretty CAS-ual Fridays flowers.